In May, some Texans will vote in a runoff election on who will replace Thomas Ratliff on the Texas State Board of Education District 9. This might not seem like national news, and it perhaps would not be, if the frontrunner hadn't said some outrageous things on social media platforms and out loud. Like, really outrageous. And it seems like she's going to win. 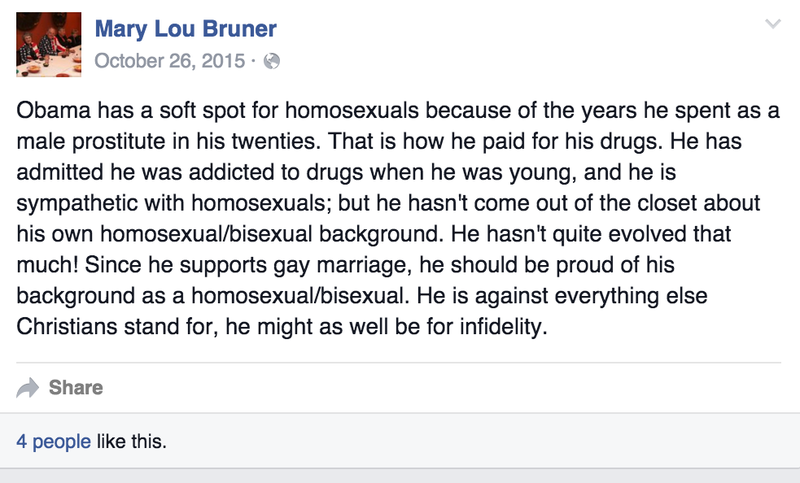 Mary Lou Bruner's anti-gay, anti-Muslim, anti-historical views were pointed out by the Texas Freedom Network (TFN) ahead of Super Tuesday, where Bruner(R-Mineola) earned just over 48% of the vote. Back in 2010, she testified in support of a resolution that says Texas textbooks are biased against Christians and in favor of Muslims. She says, among other things, "I'm biased in favor of Christianity." 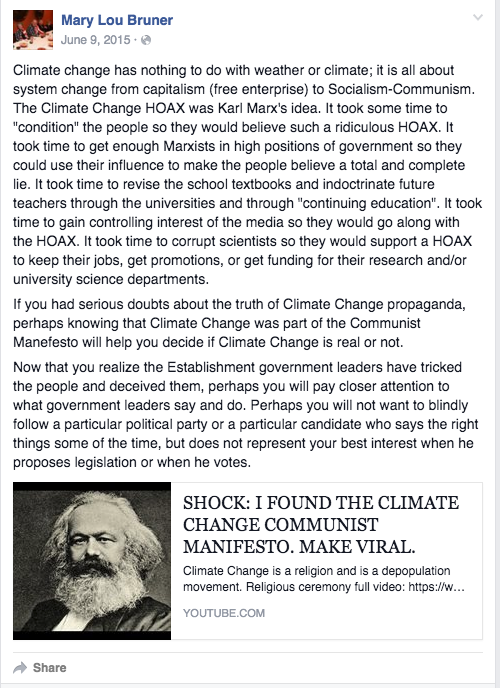 She also thinks that Karl Marx conceived climate change as an anti-capitalist hoax, that "Islam is not a religion," but "an inhumane totalitarian political ideology with radical religious rules and laws and barbaric punishments for breaking the religious rules," and that "the dinosaurs on [Noah’s] ark may have been babies and not able to reproduce. 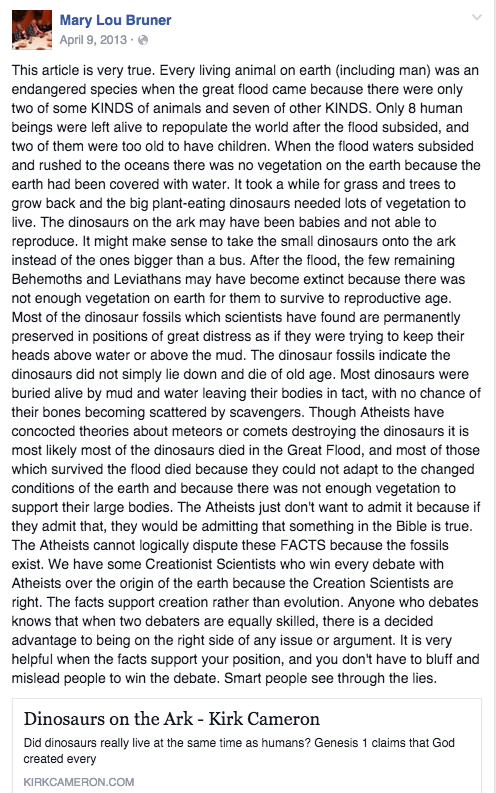 It might make sense to take the small dinosaurs onto the ark instead of the ones bigger than a bus." She's doubled down on this last opinion more recently, writing in a comment that, for now, still appears on her Facebook page: "To the television reporter who asked me while the camera was rolling if I REALLY believe there was a man named Noah who built an Ark and filled it with pairs of animals, and the entire world was covered with water: THE ANSWER IS STILL "YES, I believe the Holy Bible. I believe there was a Great Flood." 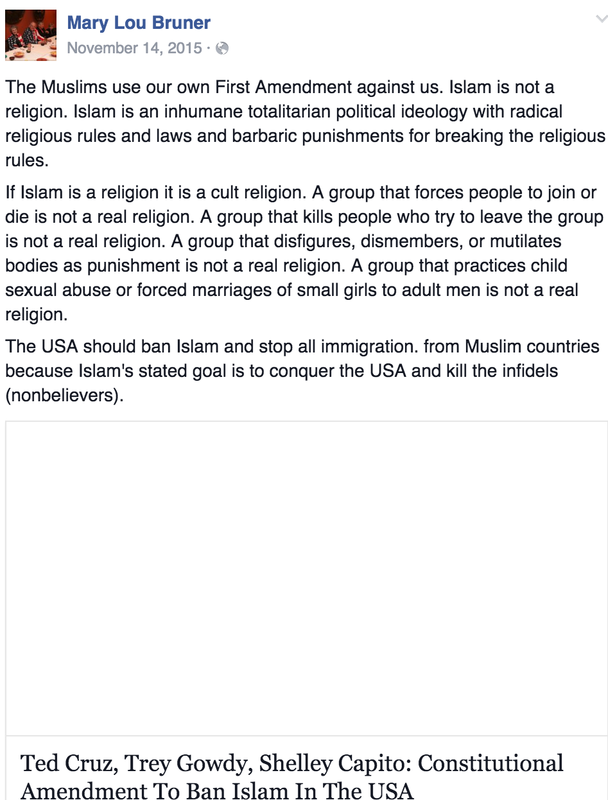 She added, "you can call me ignorant or intolerant or whatever you want, but I did not make fun of YOUR religion." Presumably, the reporter was not Muslim. On her campaign website, Bruner invites supporters to "pray for our campaign and schools daily," explaining that teacher's today face the frightening reality of school shootings. This is true, and especially frightening in Texas where new open carry laws allow students to bring guns to college campuses. But Bruner doesn't mention the laws in her theory on why school shootings have become a reasonable fear for teachers today, instead writing "School environments have become dangerous since the federal government removed prayer, the Bible, and the Ten Commandments from public schools." It's Bruner's right to say and feel whatever she wants. It's unfortunate that she has gotten so much support, and it's unfortunate that as a teacher she doesn't appear to place any value on facts. It's also unfortunate that the Texas School Board of Education decided recently not to allow a board of experts to verify the information in school textbooks before they're used in class. And that Texas curricula are often exported to other states. So please, Texans, keep Bruner's beliefs in mind when you go to the polls in May.